Today O’Neill misses out on what’s likely his greatest fantasy and Ba’al tries to get Teal’c to join the winning team. The SGC sees SG-1 return from a mission unexpectedly early but with everything seemed to be normal apart from a growing list of differences, with SG-1 forgetting which world they went to and believing Jacob/Selmak is still alive. 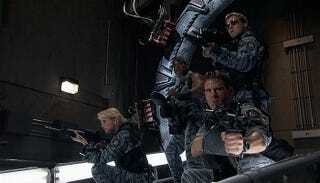 Before Landry can investigate further the answer reveals itself when another SG-1 arrives through the Stargate. It turns out that the other team are from an alternate universe where things are slightly different but somehow ended up in this universe. The interviews between the two versions of SG-1 go badly as the alternate counterparts are just as stubborn as the original versions, except for the Carters who easily work out what happened while talking. Their theory, involving a Black Hole effecting Gate connections, however means that the SGC is likely to receive more SG-1s, which includes the SG-1 from the Rambo universe. The SGC is put on lockdown as more and more versions of SG-1 arrive in a situation that’s quickly turning into a Vogue fashion shoot based around the theme of “camouflage”, including one that’s Mitchell and three Jaffa. Landry brings the original Daniel and Teal’c to meet one of the alternate faces who they might find of interest, an alternate Fraiser from the universe where SG-1 wasn’t about to be axed after season 7. While most of the alternate team members are kept in various rooms all of the Carters quickly converge on the science lab to try and solve the problem who are also joined by an unlikely guest, the Tok’ra Martouf. With the help from a pain in the arse Asgard, the team manage to work out a solution whereby the placing of a bomb inside the Black Hole should allow them to cut off the connection but would strand the 16 other SG-1s in this universe. The original and first alternate SG-1s take the Prometheus on the mission to deploy the bomb, only for the alternate team to mutiny and take control of the vessel. The alternate SG-1 reveal to the original Mitchell that their goal was to instead recover a ZPM from Atlantis to use in their own reality to power the Antarctic Ancient Outpost and defend their version of Earth from the Ori, whose territory has grown significantly faster than expected in their universe. The original SG-1 prepare to break out from the brig once Mitchell returns, only for it to turn out that the Mitchell returned to the brig was the alternate Mitchell. The original SG-1 foresaw this however and turned the trap on itself, capturing the alternate SG-1 instead (keeping up with this?). Returning to Earth the team use an Asgard device to recreate the conditions that the first alternate team created to cause the mess in the first place to send all the teams back, giving vital aid to some teams as needed such as Fraiser’s team which needed the cure to the Ori plague on Earth. So here we have the first alternate reality story in several seasons and it’s come back better than ever. This time rather than sending our team to another version of reality we see other realities invade our own time and time again. The episode is pretty clearly divided into two parts, the former a more lighthearted scenario where the SGC turns into the holding pattern for over a dozen various formations of SG-1 and the latter a more serious scenario where one of those alternate teams decides to go rogue. The first part is a lot of fun, far more fun than the show’s been for about half a season, as it lets go of the serious season arcs and instead just mucks around for a while in a series of scenes that composites various members of the team together to create scenes such as a scientific get together of Carters from all over the multiverse. None of it makes any sense and the episode has to really try to make it work internally, such as the whole “why don’t other teams appear” conversation, but again given the stupid nature of the episode it’s not that hard to overlook the internal jiggery. While it’s a load of fun it’s a shame that they don’t take advantage of the worldbuilding as much as they could’ve done. A couple of the teams throw out some detail changes, such as Bra’tac leading the Free Jaffa Nation and Jacob/Selmak surviving Dakara, but it never more than scratches the surface compared to previous episodes, where one of the strengths of episodes involving alternate realities was that it’d follow the premise through to some logical other world conclusion. It’s not the worst thing in the world and doesn’t detract from what we do get but it’s one of those things you’re just sad never happened on the show. In the latter half while the tone gets more serious regarding the fate of the alternate teams it doesn’t lose any of the shenanigans as it engages in one of the most convoluted escape plans of the show’s history where one team predicts what their alternate selves would do and then successfully counter that but the others don’t predict that would happen. It’s fun how what would usually end up being a firefight with explosions and gunfire is instead solved via mindgames, though this might’ve been also just to save money for the later episodes of the season. The latter part of the episode also has problems with how it ends. While the whole solving of the betrayal is fun it doesn’t half leave the episode rushed to the conclusion with them ending up just sending people back through the Gate with a little magic device attached to it. No bombs or Black Holes, just Asgard tech saving the day once more. Again I can’t help but wonder if the original plan had been something a bit more dramatic but time and money meant a smaller ending had to be used instead. Finally the episode also sees the return of Janet Fraiser and Martouf in small cameo appearances as one of the other teams. With the former it’s likely an apology by the show itself for killing Fraiser off when they thought they were getting canned at the end of season 7 and instead found themselves still going two seasons later, while the latter is the first appearance of the Tok’ra for almost a season now. Again I enjoyed what we got but still I’d have liked to see more of the characters. Overall Ripple Effect is a small one-off episode largely used for a few cameo appearances of characters and that while it may have problems here and there it makes up for it by being quite a fun little piece. · Can’t help but love the constant O’Neill/Carter references. · All those Carters and they don’t invent some super space gun or something? · Not long now till Prometheus no longer appears thank Christ. On Dakara the Free Jaffa Nation are trying to decide by what method they’ll be ruled by following the death of Gerak. Bra’tac and Teal’c along with others on the High Council have been attempting to get it replaced with a democratic system. The two veteran Jaffa begin to question what’s happening when their two key allies suddenly begin to work against the transfer to democracy. Meanwhile Mitchell is visiting his friend who’s in the Air Force Academy hospital, which has access to tech received via the Stargate before the general public, where they’re attempting to stop an aneurysm. It turns out that his friend was originally scheduled to join the F-302 Program but had to pull out after he was injured in the line of duty while helping Mitchell, who ended up taking his place and feels guilty for it. The advanced tech however is unable to prevent his friend’s aneurysm from being eventually fatal however. Sometime later Carter and Daniel are brought to the briefing room at the SGC to meet with Bra’tac, who reveals that Teal’c has gone missing. Along with the old Jaffa they go off-world to try and get information regarding Teal’c’s location and fate, finding that one of his Jaffa contacts had ratted him out, before concluding that someone is brainwashing key Jaffa and that Teal’c is now in their hands. One of the Council members tries to break the brainwashing by removing his symbiote (similar to Teal’c in Season 5) but dies in the process though has left a note the team is able to use to track down Teal’c’s location. At an unknown location it’s revealed that Teal’c has been captured by Ba’al, who tries to convince Teal’c of the benefit of working for him. The Goa’uld, who freely does away with the whole “all-powerful god” act, informs Teal’c that his goal is to discretely control the High Jaffa Council to present a united front against the Ori. Teal’c however repeatedly refuses attempts to coerce him, unwilling to give up the Jaffa’s new found freedom even if it does risk falling to the Ori. Mitchell receives word about the issues with Teal’c but doesn’t want to leave his friend to die alone in hospital. Carter returns to have a word with him, convincing him to tell his friend the truth about what he’s been doing the last year and helps him acquire the memory tech from Collateral Damage so that his friend can experience just what he missed out on. After seeing some of his memories his friend tells him to leave and go save Teal’c, asking him not to feel guilty about his accident. Returning to the SGC Mitchell finds himself joining a large operation to rescue Teal’c based on the info found on the body of the High Council member. The platoon-sized group easily push through and secure the Gate, with help from Bra’tac who’s acquired a Al’kesh to use as a bomber. By the time the force breaks through the defences closer to the Ha’tak however it appears that Teal’c has been successfully brainwashed, only for it to be revealed as a ruse as Ba’al had suspected when Mitchell makes it in time to help. In the aftermath on Dakara the Council successfully dissolves itself following a referendum on moving to democracy. At the SGC though Mitchell finds that his friend had died while he was off saving Teal’c, with the Jaffa coming to thank Mitchell for having helped save his life. Stronghold returns to what was one of my favourite developing storylines at the start of the season which was the look at how the Free Jaffa victory was quickly soured as it faced the reality of trying to run itself for the first time in thousands of years. This however was sadly almost done away with during the Garek arc but thankfully makes a return today. This time the focus is once again on how to run itself and the episode weaves a little democracy or benevolent autocracy debate into itself, with the main villain of the piece Ba’al pointing out that while democracy can be nice it’s also the worst system for facing down a threat as a combined force, especially when that nation is new. Both at the time of the episode airing, with phrases like “regime change” having entered the lexicon, and even today the issue of democracy or autocracy is still a potent one, especially with any conversation regarding the Middle-East. Talking of our errant Goa’uld Ba’al makes his return from the first half of the season and is still brilliantly playing the pragmatic businessman vibe. Here he proclaims himself as only wanting to provide a united defence against the Ori and has no care for what the Free Jaffa do day to day but this is never revealed as to whether be a manipulation or just a frank admission of what he’s after though given how the character develops I’m putting my money on the latter. His conversations with Teal’c also include a frank discussion that completely changes the perception of the Goa’uld on the show from one of evil villains with a plan to one where most of them likely have become just as taken in by the system as the Jaffa, with many simply playing out their own legend as they went senile years before having started to buy what they were selling in regards to the whole being god idea. It makes a lot of sense with Goa’uld like Cronus who seemed almost obsessed with acting a certain homicidal way above all else with no regards to how things actually were, such as wasting vast resources on suicide attacks. The weakest part of the episode however is that of Mitchell’s storyline. It’s clearly aimed to add more to the character backstory but comes at the wrong time in the season. Up until now he’s never been shown to feel guilty about his place or worry about an outside issue but now suddenly he’s entirely shaken about his place at the SGC. This could’ve worked really well if it was episode 3 or 4 but as episode 14 it’s too late in the season to feel authentic. At the end of the day the episode is a good one with how it alters and adds to the show’s mythology but isn’t the best when it comes to a self-contained story, feeling out of place. The conclusion however does add some more of the action-packed scenery the show splurged highly on during seasons 7 and 8 however. · I see Mitchell and his mate have good taste in pixelated death games.